Usually I am the type of person that would rather buy something at full price than try to attempt to make it myself. I wish I was half as crafty or had an eye for design as a lot of you are. I love following Instagram accounts of people who decorate their homes with beautiful “farmhouse” decor. 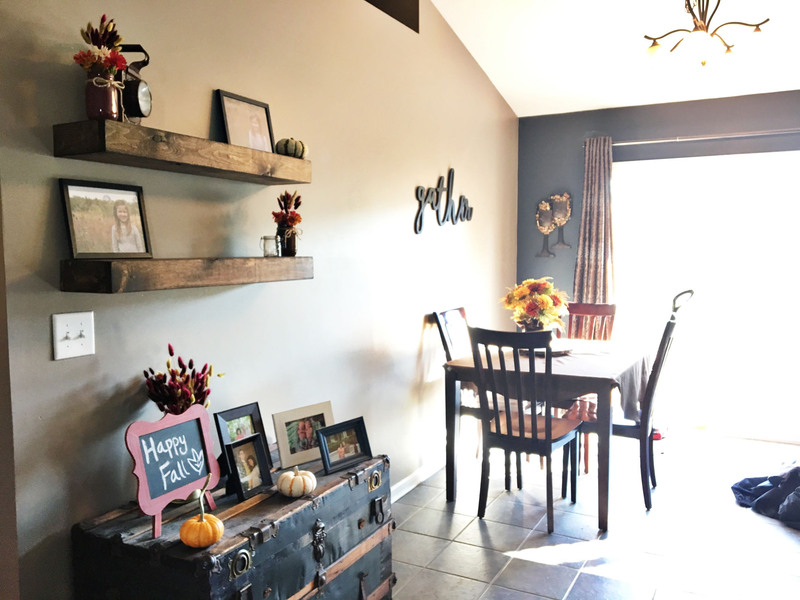 The farmhouse look is TOTALLY my style and I have dreams of turning my ranch style home into my farmhouse Pinterest board. If only I could find a real farmhouse with lots of land, right? Well, I decided to take baby steps and MAYBE one day my house will be full of neutrals, old wood and shiplap. 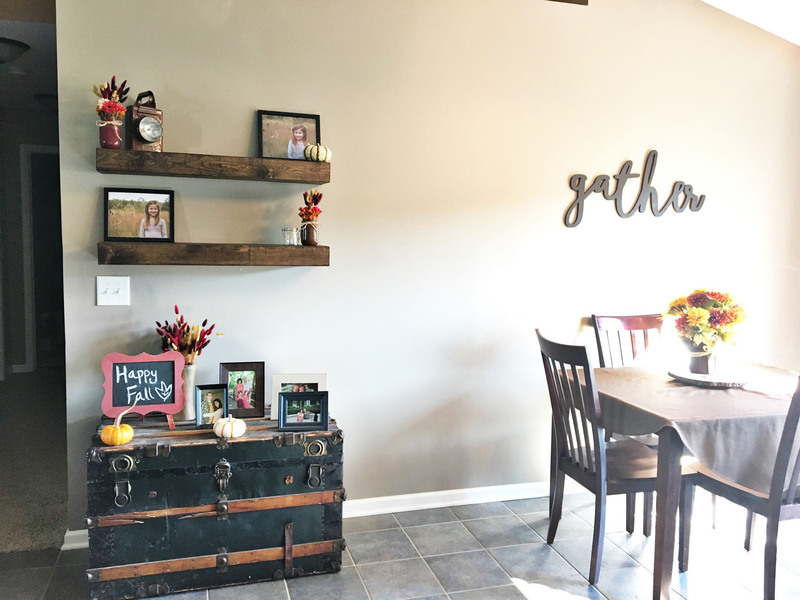 Almost every farmhouse I have seen has beautiful open shelving that I just swoon over. So, I talked to my not so handy husband (love you babe ;-)) and we decided to try and tackle this project on our own. We told each other that if we failed, it would be fun just doing a project together. Well, I don’t know how much fun I actually had (it was stressful because I didn’t want to mess up!) but guess what… WE DID IT. Not only did we finish it but they actually look really good! 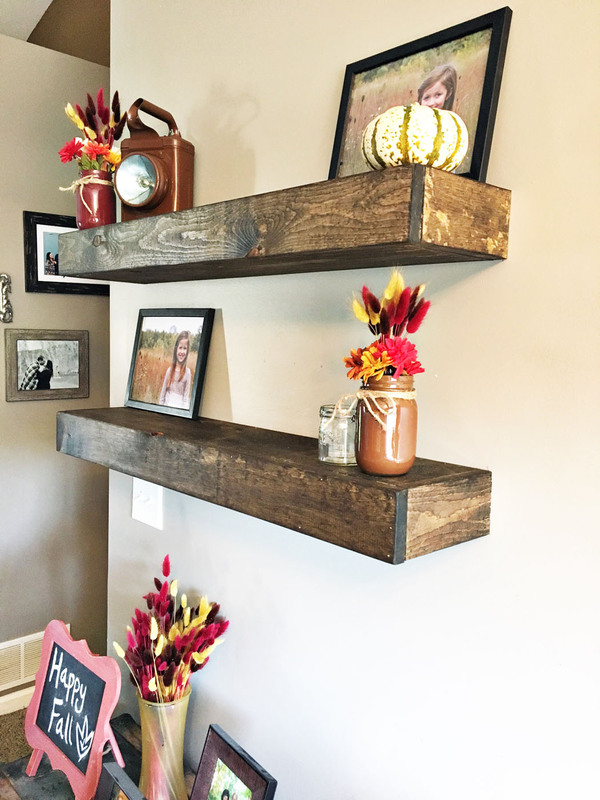 First I found a DIYer who had posted these amazing shelves on her blog, so we followed her instructions. Then we headed to Menards to pick up some wood glue, stain, and wood. All the other tools and materials we already had at home. We spent about $35 for everything, with the stain being the most expensive item. 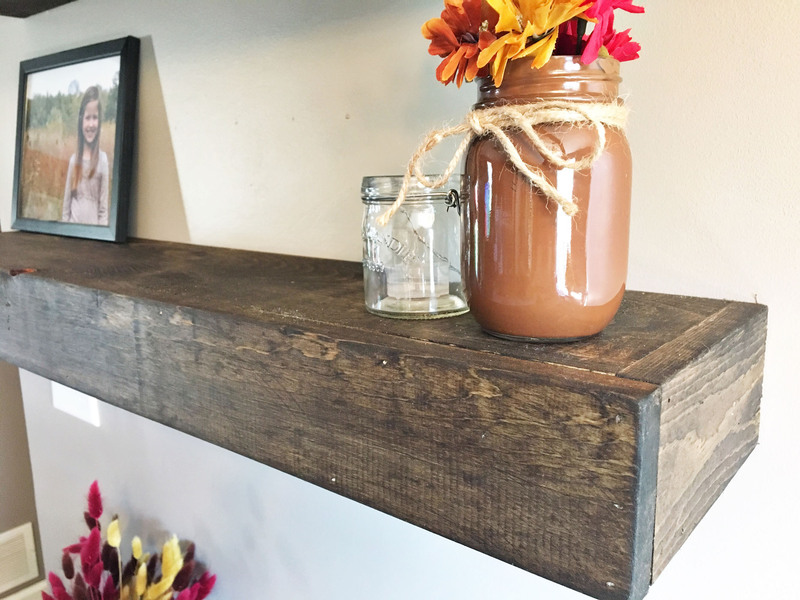 If you already have stain at home then these shelves could only cost you about $10! 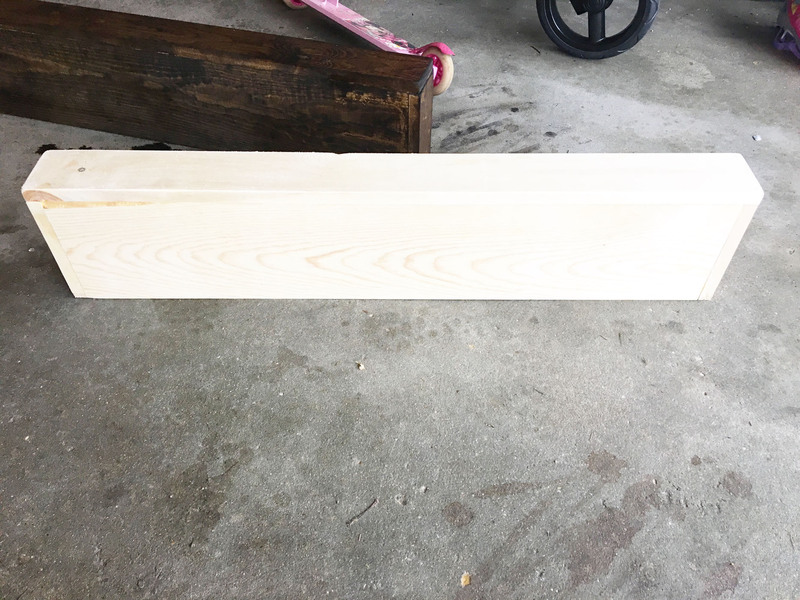 Just a tip if you are ever buying wood at the store…. BRING A MEASURING TAPE WITH YOU. The wood pieces seemed pretty well organized into their own little cubbies with signs. Well, we got home and almost every piece of wood was the wrong measurement then what the sign said. We had to twerk our original measurements a little because we didn’t want to go back to the store. 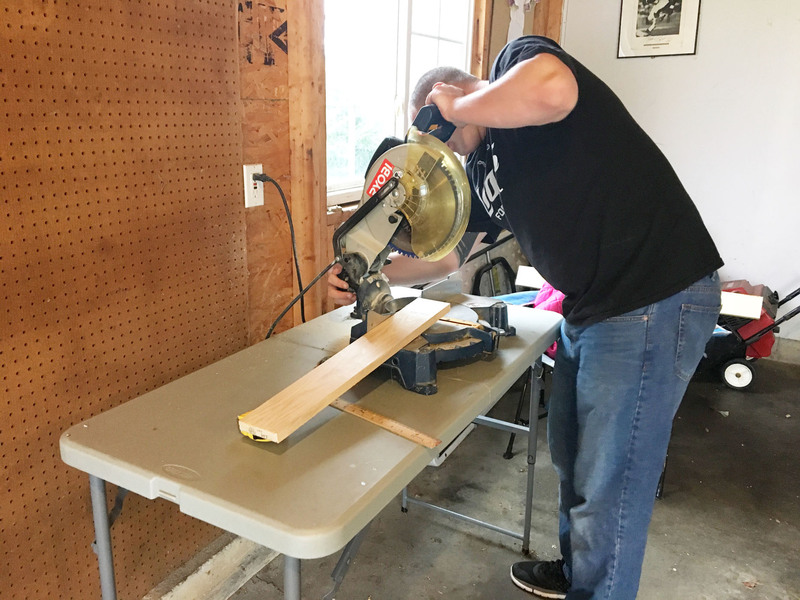 So, we got home and Cody broke out his saw for the first time. Oh my gosh… he was the cutest. I could tell he was having fun, even with me dictating behind him. 🙂 We cut all the wood to our new measurements and started gluing/nailing the pieces together. Make sure you check out the blog I linked in the paragraph above to get a full list of instructions. I was terrified of the nail gun so Cody had to try and hold all the pieces together and nail at the same time. After the shelves were built I sanded them down and rounded out the edges. 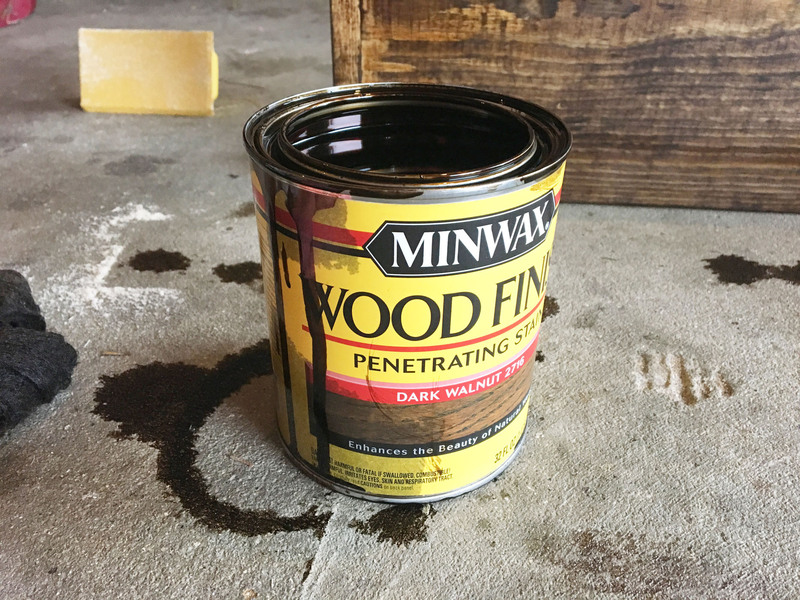 I did one coat of dark walnut stain using a cheese cloth. It was the perfect color! I also didn’t lay anything down so now we have what looks like oil stains in our garage. Oops. The shelves dried and we hung them on the wall using the supports Cody built while I was staining. 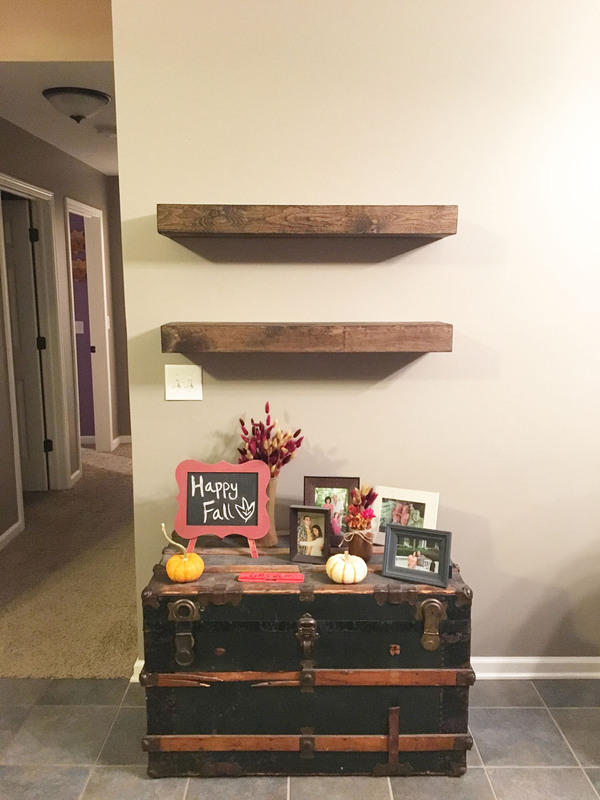 I wanted them directly above this old trunk we have because it is such a statement piece in our home.